Look To The Stars reporter Delinda Lombardo recently attended the star-studded World Poker Tour Invitational in Los Angeles and caught up with some of the celebrities involved. On March 1-3, celebrities and poker professionals hit the felt for the 6th Annual World Poker Tour Invitational at Commerce Casino in Los Angeles. More than 100 celebrities were invited to compete for a seat in the WPT Championships while raising money for charity, including a side pot worth nearly $30,000 that went entirely to charity in the names of the final 13 celebrities in the field. The three title charities of the event, guaranteed to receive at least $2,500 each, were Soles United, Susan G. Komen for the Cure, and Harbor Private Funds. 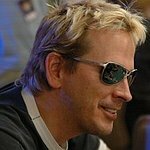 Poker professionals, including Phil Laak, Shawn Sheikhan, Allen Kessler, Kathy Liebert, Jennifer Tilly, Billy Baxter, David Pham, Kenny Tran, and Antonio Esfandiari (who was just named the official spokesperson for the WPT) flocked to the highly successful event, which is now in its sixth year. Actor James Woods has already established himself as one of the ‘best celebrity’ poker players out there. After losing his brother to a stroke in 2006, it came as no surprise that he plays for the American Stroke Association. “I’m playing for my brother,” he told me. Lakers owner Jerry Buss was also playing cards, but it was Lakers forward Ronnie Turiaf who came out a winner. Turiaf has been coping with a heart aliment that didn’t seem to stop him from making the best of it. The name of his foundation – Heart to Heart. Another celebrity taking the time to discuss his charitable efforts was actor Nicholas Gonzalez (Undressed). Gonzalez plays poker on a regular basis, but was much more interested in promoting his charity than his poker skills. Gonzalez was playing for Friends of El Faro, an organization that helps needy kids and families in Tijuana, with celebrities making routine visits across the border into Mexico. When asked about his role, he was quick to take the attention off himself. “You know, it’s a great cause that I’ve been working with for a while,” he said. "One of the biggest proponents of El Faro is Molly Sims, who has a contract with Cover Girl. They even supported her work, went down there and talked to the younger girls, made up their faces and took pictures. Also Shannon Elizabeth, Adam Rodriguez, and especially Sharon Lawrence, who has been a really huge supporter – there’s a lot of celebrity friends. We used to have big gala every year in Hollywood that’s very well attended, but really, like I said it’s about getting down there, it’s not about who anybody is, it’s about spending time with the kids. We do everything from build playgrounds, to rebuilding kitchens, to knocking down walls – that kind of thing. " Actor John Hawkes (American Gangster, Deadwood) was knocked out of the poker tournament early on, so I spent some time chatting with him about his charity efforts. Had he not been eliminated, his winnings were earmarked to help save a few animals. Hawkes in also involved with the 1-Second Film Project, a non-profit collaborative film that anyone can be part of. Hawkes is listed as one of the celebrity producers, along with Brett Ratner, Spike Jonez, and Kiefer Sutherland, who are raising money while creating the Worlds Biggest Short Film. All profits raised by the finished film will be donated to the Global Fund for Women. Tom Everett Scott (Cashmere Mafia, Saved) was playing for a cause close to his heart. Brian Baumgartner (The Office) was there to help raise money for those writers who were affected by the writers strike. Other celebrities in attendance included Mimi Rogers, who was playing for the Dream Foundation, actor Dwayne Adway (Into the Blue_), who was very proud to support the Creative Coalition, and James Kyson Lee (_Heroes) who has been inspired to start his own foundation. Other celebrities in attendance included actor Don Cheadle, Meat Loaf, Ryan Stiles (Drew Carey Show_), Donnie Wahlberg (Kill Point_), Mekhi Phifer (E.R_. ), Eric Paladino (E.R. ), Jonathon Schaech (Prom Night_), Joshua LeBar (Entourage_), Joshua Morrow (Young and the Restless_), Lukas Haas (Death in Love_), comedian Doug Benson, Camryn Manheim (Ghost Whisperer_), Louis Lombardi (Sopranos, 24_), Jeremy Sisto (_Law & Order, Six Feet Under), Andy Milner (Weeds), Aaron Paul (Breaking Bad), Michael Vartan (Big Shots, Never Been Kissed), Ron Livingston (The Time Traveler’s Wife), Tia Carrere, and Andy Hirsh (Big Love). Congratulations to the winner of the event, Van Nguyen, who became the first female in history to win a mixed WPT tournament. She is married to poker pro Men ’The Master" Nguyen.